What're They Supposed To Do? These aren't boots for the casual hiker. They're overbuilt, heavy, rugged, stiff and, at $300, expensive. 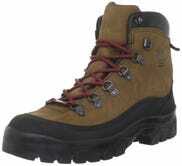 That's because they're meant to be the ultimate long-lasting, rugged, bulletproof hiking boot. The vast majority of people will find them hot, heavy and stiff. But, those of us that spend huge amounts of time outdoors, on challenging terrain, in extreme weather will appreciate their ability to find traction, keep you dry and, most importantly, protect your feet and ankles from twisting, crushing and impacts. How're They Supposed To Do It? The most immediately apparent feature of the Crater Rims is the rubber "rand" that wraps the boot's nubuck leather upper where it meets the Vibram sole. That's there to protect the leather from being abraded or slashed by particularly challenging terrain. Think sharp volcanic rocks or big, thick thorns. Unlike most other boots, that rand is stitched and glued on, not just glued. The replaceable Vibram Bifida sole uses big, omni-directional tread blocks to give the boot grip in all directions and is supplemented with a fiberglass shank, to prevent the sole from bending. Combined with the hefty rubber sole's ability to absorb energy, that gives the boot an excellent ability to mitigate impact energy before it reaches the wearer's foot. The top-grain "nubuck" leather upper is six inches in height and, being natural leather, takes oiling or waxing extremely well. That would be enough to weatherproof the boot, but Danner has also incorporated a Gore-Tex bootie that encloses the foot all the way up to the black trim piece. To make the Crater Rim, Danner's used its 610 last, an internal shape that's generously sized around the toe and snug around the heel. It's available in two different widths and designed to work with most foot shapes and can be supplemented by orthopedic shoe inserts should you want to tailor the padding, support or grip inside the boot. As a side note: you should learn about inserts and employ them to enhance the comfort and support of any quality item of footwear; nice stuff like these Danners are designed to allow you that ability to tailor them to your individual needs. Those heel and toe boxes are ridged and strong, helping lock your foot into the boot and providing further protection from impacts and crushing. The portion of the boot surrounding the ankle is also heavily padded, again, providing impact protection. Long time readers will know that I'm also a motorcycle journalist with a strong background in covering and promoting safety gear for that sport. And using it. While not quite as safe as a dedicated pair of motorcycle boots, these Danners are capable of providing real impact protection, even in a significant motorcycle accident. That's saying something and means your feet and ankles will be safe carrying heavy loads over difficult terrain. Finally, the lace-to-toe design doesn't just help keep your foot secure, but further tailors the boot to your individual foot shape. How Do They Perform? These boots are hard to put on and take off. As difficult as any of the motorcycle boots I own. That's a good thing, meaning your foot is solidly retained and located within the boot, with minimal potential for slippage, even during a fall or accident. At 58oz, they're also substantially heavy. Again, for their intended purpose, that is a good thing. They're built to be as heavy-duty a pair of hiking footwear as possible. User serviceable and shop repairable. If you're looking for a lightweight hiker, these are not the boots you're looking for. But, they do fit well and are very comfortable. Spend some time getting just the right size and you'll be rewarded with a seriously comfortable boot from the off. Mine haven't given me a single blister, not on the first, 4.5 mile test hike, nor the 50 mile backpacking trip that followed or on any of the trips or casual wear since. These were a birthday present from the best girlfriend ever, back in December. Since that time, I've hiked with them in the snow, in the desert, up Mt Baldy and down Tar Creek. Southern California tends to have uncharacteristically challenging hiking terrain, covered in loose scree, sharp rocks and large boulders. One of the hardest challenges for any boot is maintaining traction and ankle support while descending steep, uneven terrain on a loose surface. At that, the Crater Rim's excel, never once failing to provide secure footing and good support. Waterproof? I've stood in ankle-high puddles for minutes at a time with no intrusion. 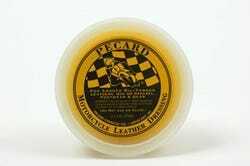 By treating the uppers with Pecard's Motorcycle Leather Dressing, water now beads up and rolls off the surface of the boots without even penetrating the leather's surface. You should treat any pair of leather boots similarly and regularly to both weatherproof and preserve their hides. I've tested their ability to cushion impacts and reduce torsion too, dropping off boulders with total vertical drops of six feet or more, onto uneven surfaces, while carrying a 30lbs backpack. Each time, the Danners found a surface to land on and stuck there with no detectable forces attempting to twist or turn my ankles. My only real problem with the boots is in their lack of breathability. While Gore-Tex is an excellent membrane at being waterproof, it's been superseded by more modern technology at being breathable. eVent or a myriad of other membranes are now available that are equally good at keeping water out, while letting air in. That's not to say the boots don't span a huge range of comfortable temperatures, just that they'd be more comfortable on hot days with a more modern membrane. Adventure Ready? I still go for my five-year old, heavily-ventilated pair of Salomon trail shoes for my daily hike with Wiley up Runyon Canyon. The Danners just don't ventilate one-tenth as well and their apocalypse-proof support isn't needed if I'm not carrying a load. Their weight, too, makes the 1,500 feet of elevation gain on that hike just that much harder. But, if a backpack is coming out, if there's snow or rain or mud or even if I'm just doing something active, followed by the need to look nice, it's the Crater Rims hands down. These are a versatile, rugged, nice looking boots that offer unparalleled protection and support, excellent comfort and solid traction, no matter the terrain or weather. If you're serious about spending time in the outdoors then you'll need serious footwear that lasts. And, at that, nothing compares to these Danners.